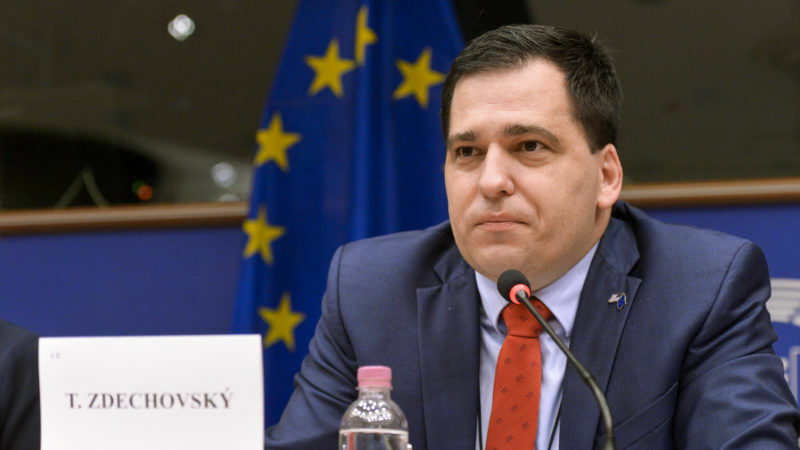 Tomáš Zdechovský is a Czech EPP MEP and a member of the Christian and Democratic Union – Czechoslovak People’s Party (KDU-ČSL). He spoke to EURACTIV.cz’s Editor-in-Chief Adéla Denková. How would you evaluate the current relationship of the Czech Republic to the EU as an organisation that the Czech Republic is part of? The current government has made a great shift. From the troublemaker who has always been against everything, to the current state where the Czech Republic is playing a rather constructive role in the EU. This is reflected in the fact that the Czech Republic is invited to meetings in which it could not take part before. Topics which have been brought forward by the Czech Republic – such as the dual quality of food – are taken relatively seriously in the EU. Which of the Czech topics was able to reach the European agenda over the past period from 2010 to 2013? I cannot remember any. Now it is not only about the dual quality of food, but also the question of safety of long-distance drivers or the question of cyber security which the Czech Republic has repeatedly raised in recent years. Is it not funny that in the Czech Republic, the dual quality of food is the biggest issue connected with the EU, while elsewhere the future of the whole European project is being discussed? Most people in the Czech Republic do not understand the meaning of the EU. But it can be explained on details like this. For those who think that the issue of dual food quality is ridiculous, I would like to say that, according to surveys, the Czechs simply do not know anything about global EU strategies or energy networks. But they know very well that they may buy cheaper and better food in Germany. And that a product with the same brand and in the same package may have different ingredients in the Czech Republic and in Germany. The EU simply begins in the stomach of a Czech citizen and goes further to topics that are associated with global security. But we cannot underestimate any of these issues. So, do you agree with the frequent opinion that the problematic relationship to the EU stems from the fact that the Czechs simply do not understand it? The Czechs do not understand it and nobody informs them about the EU. When we drive by car from a session in the European Parliament in Strasbourg, we are tuning through various radio stations. In western Europe, you hear a lot of information on the radio about what the European Parliament has been doing. There is little of similar information in the Czech Republic. That is why I try to point out issues that the citizens are concerned with. For example, it is the safety of lorry drivers. This is not only about drivers themselves but also about their families and, of course, employers. Or, if someone gets an unjustified fine in the Netherlands, the remedy will be easier than if it happened in a country outside the EU. It is important to emphasise that democratic principles work in the EU and it is easier for people to get justice. You are suggesting that the media should try harder. What about the educational process? How should it focus on the EU? I often give lectures at Czech schools and I hear from teachers that they do not know how they should teach about the European Union, that there is no proper teaching material, that teaching the history of the EU and teaching the geography of the EU is useless. In my opinion, emphasis should be laid on information about EU competences to show what it is good for. Many teachers do not know it, which is a shame. In this, we should definitely extend our education. Does the situation in the Czech Republic differ from other “new” EU member states? The EU is perceived more positively in Poland, Slovakia or Hungary. From my own experience, I can talk about Poland, where the EU is much more visible. I must be quite critical to the European Global Navigation Satellite System Agency, which is based in Prague. It is in charge of one of the most important parts of research in the EU, but it is simply invisible. It has a building in Prague with a “GSA” abbreviation and some logo that does not even look like it belongs to the EU. Flags of the Czech Republic and the EU should fly in front of this building and information on the results of their research should be reported in the media. Czechs complain about Brussels, but they can complain about Prague, too. There are three hundred people in Prague who are paid from the EU budget, including people who represent the Commission, Parliament, and so on. Who knows about them? The situation is quite different in Poland. When we look at the European institutions, their communication seems to be gradually improving. And from Juncker’s last speech on the state of the Union, it is evident that the Commission has also learned how to communicate with central European countries. Would you agree? Juncker’s last speech was the best in history and showed that people connected with the European Commission are changing their thinking. They begin to understand that if they do not want to lose the central and eastern European states, they cannot just command, but should discuss things and take seriously the issues which some people are laughing at. I see this in the European Parliament. When I arrived at the beginning of my mandate in 2014, I felt that there was a bigger effort to “crush” us. I do not have this feeling anymore. How do you look at the cooperation of the Visegrád Group? I would be glad if the Visegrád Group played a significant role. But we have experience with Poland negotiating compromises with other countries behind the back of other V4 members, and so on. Either the states will adhere to their agreements and will proceed uniformly – then they will be taken seriously. Or they will behave the way they behave today – everyone is going to pursue their own policy – and they will not be serious. See how we do when we purchase military equipment. We could work together, but we all follow our own line. Do you see any other interesting allies that the Czech Republic has or should have in the EU? It’s definitely Germany. The Germans understand the Czech position in a number of things, and I think that the Bavarians are – and now after the elections will be – much more inclined to the Czech positions, for example on the issue of migration. Then there are the Slovenes, Romanians, Bulgarians or Croatians. In a number of things, we can look for a common position with the Baltic States, as well as with the Austrians. I think we have neglected these relationships for a long time. One of the factors that divides the EU countries is membership or non-membership of the eurozone. How do you look at the euro question? Should we accept the common currency? And when? The question of adopting the euro was the question of the parliamentary elections. Whoever forms the new government will also decide whether we will be part of the eurozone within four years. The debate on the euro has long been absent. I expected that this debate is going to be more intense before these elections. But it has not happened and I think that nobody really wants to join the eurozone over the next four years. Without a political debate, the euro will not be accepted. The European Parliament cannot make this decision, the only one who can is the Czech government. I am personally a proponent of joining the eurozone, but only after a really long and expert discussion. It should not be based on emotions and pseudo-arguments. I see the benefits of the common currency, but the decision must also be helped by experts who can consider all the impacts. The debate about joining the eurozone has economic aspects, but also political ones. Do you think that in certain moments, the political aspects have more weight than the economic impacts? In the Baltic countries we could see that the political aspect was more important than the economic one. The threat of some big hegemon is not so strong in our country so we do not perceive this political aspect so intensely. But of course it is here. At the moment when any country of the eurozone would be attacked, it is a huge problem for the common currency. At the moment, however, I think the economic aspect is more important. At the beginning we talked about the Czechs’ view of the EU. It could be positively influenced by money from EU funds. But subsidies are often spent ineffectively, sometimes we spend them on useless things and so it is just another blot on the EU reputation, although the Czech authorities are often responsible for that. Is it possible to do something about this? Certainly, and I think that the EU has already succeeded in shifting these things. Together with two other Czech MEPs (Martina Dlabajová from ALDE and Miroslav Poche from the S&D) I am in the Committee on Budgetary Control and I can say that the emphasis on the efficiency of the use of funds is prevalent today. We do not ask how expensive the project was, but what benefits it brings to the state or region and how effectively the money was spent. Recently, they have opened a reconstructed railway station in Pilsen, Czech Republic, which cost €75 million. But there was no mention of €75 million, just information that transport is speeding up by a factor of four and it is thanks to the EU money. I like this approach. It is expected that in the next budget period there will not be as many subsidies as we see today. What does it mean for the Czech Republic? We will have to concentrate more on projects that are really investment-focused and that will bring us more money. It should be our preparation for the fact that there will be less and less cohesion money for the Czech Republic. In 2028, the Czech Republic – like Germany – will contribute more to the common bill than it will get back. Contributions will go to projects of European significance, research centres, and other things to boost EU competitiveness in comparison with China and other countries. We should therefore be better prepared for the competition between member states over the next period. We should accelerate the construction of relevant infrastructure. I would appeal to the new government and the opposition to sit down after the elections and set priorities for forestry, water management or transport infrastructure. In seven years, a lot of things can be done, but when it does not start now, then time will run out and it will look the same as today. Today, we are cheering on the opening of three kilometres of the highway, while in neighbouring Poland, they open sections of 15 or 20 kilometres and the construction is significantly faster.